Devil Pig : Forum » Stompa! 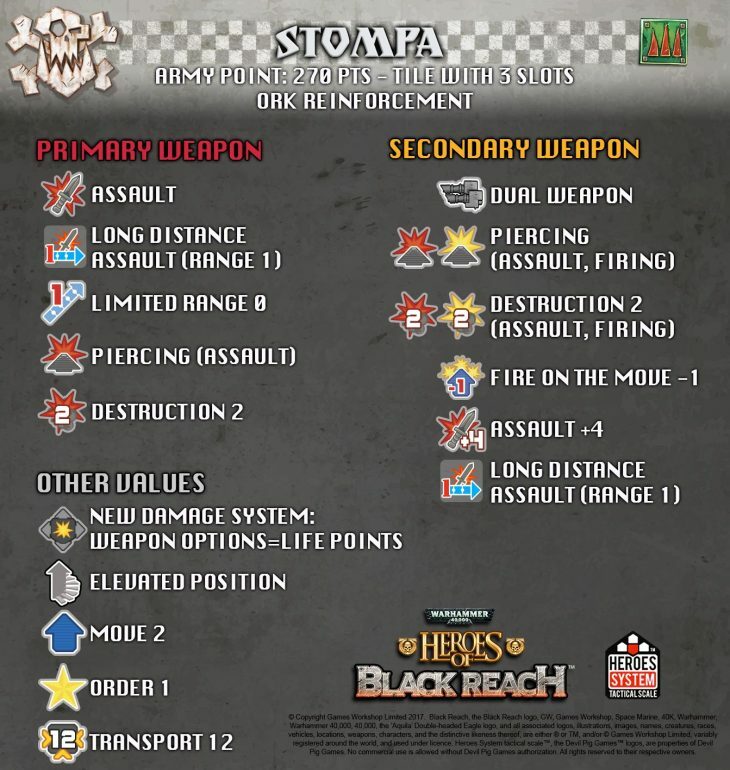 Forum » [English] WH40K Heroes of Black Reach » Heroes of Black Reach » Stompa! In fact, Elevated Position is missing from the latest version of the unit, but then again there is a new "Titan" icon, so it may incorporate the same sort of mechanic. Nice, nice, looks very good. New stuff? Is this going to be the next P500? It looks like the footprint of Reaver titan and Warlord titan are about the same even if the Warlord is taller. The Warhound titan footprint is smaller than that. I think getting a Reaver or Warhound would be possible. It is the footprint that is important, not the height of the machine. DPG can always give us a Knight if a Titan is too big! But that symbol on the Stompa depicts a Warlord titan, so it's obviously in the consideration at least. The Stompa is at the third line in that scale. It is almost as large as the Warhound Titan. 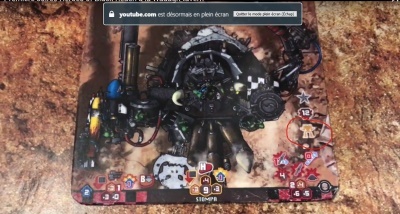 If you go to this article he has a great shot of the Stompa next to an Imperial Knight and a Chaos Warhound. I would imagine an Imperial Knight would make a lot more sense from the scale of the battles. I also agree anything larger might be too much for the scale of the HoBR battles. We'll talk about it… very soon. I don't know a lot about WH40K but it only stands to reason that if a "Stompa" is in the works then something equally large is also in the works to oppose it. Those of you who are more familiar with the 40K universe would or should know what units would be an even match, that of course being a requirement for competitive gameplay. What would be an even match for a Stompa? Space Marines don't have anything that matches a Stompa in size and strength. They do have tanks (Predators, Land Raiders,…) that can shoot a Stompa to smithereens. Space Marines do have a Thunderhawk, which is a super-heavy flyer/transporter (can transport 3 entire squads) but this seems hard to incorporate in the game. If DPG can only make Space Marines then probably nothing big for the Space Marines will be published. This is a great point. The restrictions GW places on what can be made by DPG is as important as what the 40k Lore says would be used. Either of these or a Land Raider Ares would also be fun to toss as the Stompa with some Terminators along for the ride. Both the Eldar and Tyranids are very different armies from the Marines and Orks, so great selection for the next two armies. But since that box is more than year away, I'm more focused on the new Orks and Marines. When do we know more what is coming for them apart from the Stompa? I'm very curious about faction identity and new mechanics. I like how the Orks play very differently than the Ultramarines, and I expect both Tyranids and Eldar to be even more different. But first : 2 HoBR products for next P500 !! Just a Stompa won't be enough to count as a product I would guess. B) 1 product with Ork & Space Marine units and 1 product with terrain tiles ?